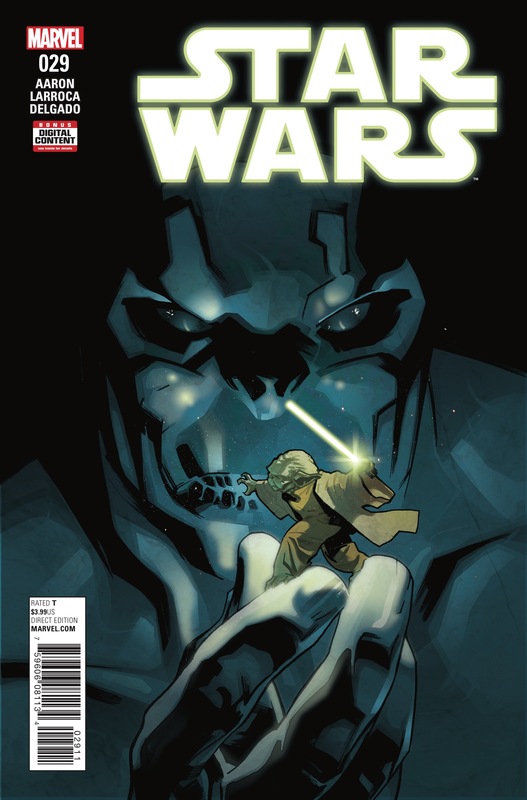 Star Wars #29 Review – AiPT! ”Yoda’s Secret War” continues this week in its third installment. He’s become an apprentice of a strange boy inside a strange mountain and the Force is strong all around him. Time to find out why! Is it good? I’ve been dying for some kind of answers for two issues so dammit we’re bound to get some this week. Writer Jason Aaron and artist Salvador Larroca are crafting a tale that’s big in scope as it captures a facet of the Force we’ve never seen. Sounds compelling for Force fans around the world! There’s certainly something quite extraordinary revealed in this issue. I can’t say what it means just yet, but it’s clear Aaron is showing us there’s more to the Force than we may think. A big gripe I had last issue is answered on the very first page–namely what is Yoda looking at–which leads to the big reveal itself. It’s impressive, and equally interesting because Yoda is still rather young (for his species anyway) so we’re getting some insight into why he’s so damn good later. Yoda literally goes to war in this issue and it leads down a road very unexpected. I didn’t expect, for example, for Luke to play such a large role in this story. Due to the size of what is revealed and the ramifications for Luke’s discovery at the end this is a key issue Star Wars fans shouldn’t miss. The art department fares rather well too. The “extraordinary” reveal–avoiding spoilers here–is impressively strange. It’s large and quite difficult to put its size in scope in comparison to Yoda, but Larroca does it well. That scope is a key factor in the closing pages of the issue and helps create a stark contrast from the still untrained Luke and the Yoda who faced war. Pretty sure you could use the Force to move the lava…though how much I’m not certain! A certain character introduced last issue ends up being a very important one by the end. Aside from being an outcast, I’m at a loss for who they are or whether or not we need to care about them. The story is quite good at showcasing a large scale and big ideas, but the characters feel paper thin and aren’t very interesting. Thankfully we only have to wait a week for the next issue, which is good because a duel is in order! Fans of the Force need to see this as they’ve never seen it utilized quite like this.